'Neither Aamir's hard-at-work whimsicality nor Amitabh Bachchan's stoic presence can salvage a second of this bloated, blundering bore,' fumes Sukanya Verma. The movie is so atrociously stale and dreary, it makes Manoj Kumar's Kranti look like a work of a dystopian future and rebooting Pirates of Caribbean an agreeable idea. Neither Aamir's hard-at-work whimsicality nor Amitabh Bachchan's stoic presence can salvage a second of this bloated, blundering bore. 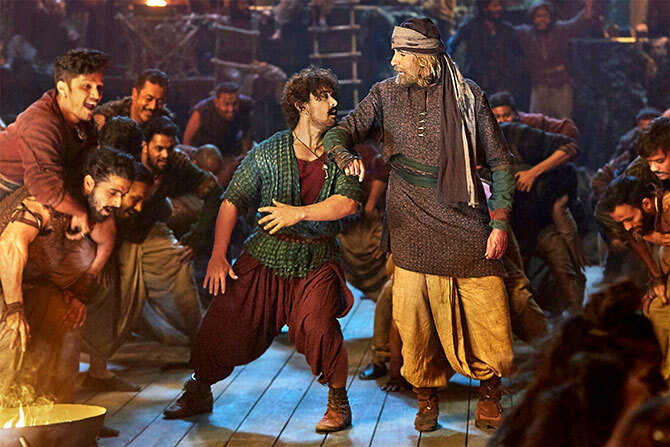 Unlike Acharya's masala-coloured Tashan and Dhoom, Thugs of Hindostan is an empty spice box that forgot to progress beyond a star-studded cast. Sans chemistry, camaraderie and charm, you'll find more imagination in Baahubali writer K V Vijayendra Prasad's trashcan than Thugs of Hindostan's witless spectacle. Sana Shaikh is essentially Gamora raised by Katappa instead of Thanos. Except no matter how fierce her warrior avatar looks or how furiously she leaps and pulls out her archer's kit, she is never above her damsel-in-distress fate with constant need of masculine supervision. When it's not AB, there's Aamir as Firangi Mallah, a jackass-riding, conscience-juggling Jack Sparrow-clone at her service. His shabby, costume-y, kohl-eyed, shifty-faced enthusiasm is a cross between a lecherous Prem Chopra and Paintal's Shakuni. There's Katrina Kaif too -- flaunting her rubberlike frame in two songs and three scenes. If she appears smug, it is mostly because her much-maligned Hindi accent sounds so much less lousy around the infuriating phirang assault. Thugs's biggest drawback is its inability to have fun. 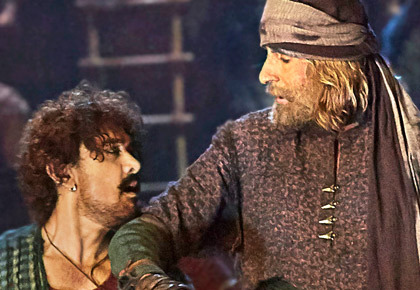 More charpai of spears than game of thrones, Thugs of Hindostan's only real special effect is to make Aamir Khan almost as tall as Amitabh Bachchan in some scenes. Like when the villain's sidekick spots the hero in the pre-climax group dance but is stopped from arresting him right away so that the performance goes on uninterrupted for the audience's viewing pleasure. When the heroine places her hand on the hero's wrist only to sheepishly withdraw fearing to get too close. I looked too -- at my watch -- it felt like a century had passed.